World Scientific Publishing Company, 9789814644013, 432pp. This is a one-of-a-kind book: combining easy-to-understand science, in-the-trenches political warfare, and inspirational stories. It aims to give hope to individuals and families who suffer from chronic disease or disability; to point out how ordinary people can make an extraordinary difference in the battle to ease suffering and save lives through supporting medical research; to share in "people talk" some of the amazing progress already achieved in the new field of stem cell research; to show how even such a magnificent success as the California stem cell program is under constant attack from ideological groups; to offer medical research as a force for international cooperation; to suggest how cure research lessens the need for the mountainous costs of endless care.Unparalleled background: the author has been involved in virtually every important stem cell battle (state, national, and international) since embryonic stem cell research began. 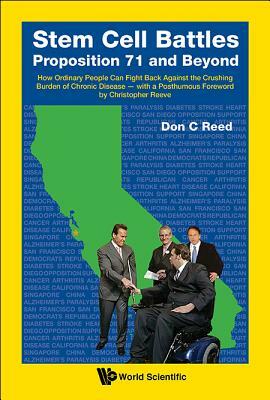 The author works closely with Robert N. Klein, sponsor of the California stem cell program, the largest source of such stem cell research funding in the world. In addition, the author is an award-winning teacher as well as writer, and seeks to entertain as well as educate. His book is not only substantive, but also fun.The book would be a treasured gift: for anyone suffering an "incurable" illness or who is a caregiver for a loved one; for a college student considering a rewarding career in biomedicine; for scientists who want to protect and enhance their research funding; and for anyone who wants to see government respond to the needs of its citizenry. Chronic disease and disability are a prison: cure is the triumphant escape -- wheelchairs should be for temporary occupancy only.